Towards the end of December 2012, I had the great pleasure of being interviewed by Marcus Morey-Halldin, of Svergies Radio (Swedish Radio) about my PhD research project on The Phantom. Marcus was producing an on-air segment about why The Phantom (or Fantomen, as he’s known in Sweden) has become such a Swedish institution – but also looking at what the future holds for Fantomen, given the changing tastes and composition of Sweden’s comic-book audience, as well as the relevance of heroes like Fantomen in modern Swedish society. 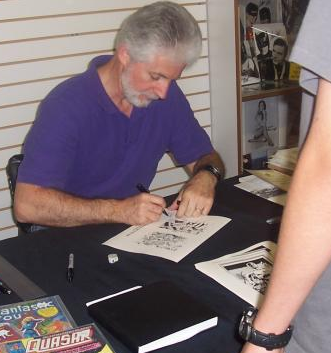 Ulf Granberg, the recently-retired editor of Fantomen magazine, was also interviewed for this segment. Naturally, most of the segment is conducted in Swedish, but for English-speaking listeners, you can hear my comments interspersed throughout the segment, which can downloaded here. 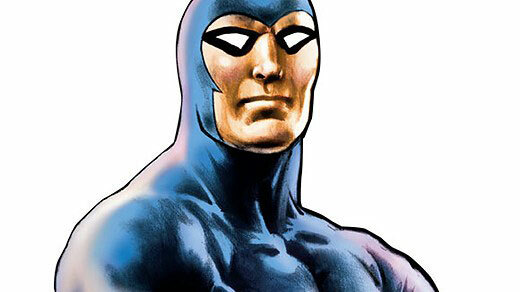 The Phantom – A “Swedish” Hero? I mention this anecdote for a number of reasons. Firstly, the fact that a complete stranger in Stockholm would freely discuss The Phantom/Fantomen with me suggested that, perhaps for older generations at least, The Phantom still resonates with them. Secondly, because this chance meeting occurred after I’d commenced interviews with a number of current and former members of Team Fantomen, wherein we discussed the idea of The Phantom being refashioned as a distinctly Swedish hero. One of my interviewees suggested that The Phantom embodied the Swedish notion of “lagom” which, in English, roughly translates as “just enough”, or “just the right amount”. This was because, even though he resembled a costumed superhero, the Phantom wasn’t too fantastic to be unbelievable – unlike, say, Superman (known as Stålmannen in Sweden), whose invulnerability and super-powers made him too implausible to be widely embraced by Swedish audiences. The Phantom, while undeniably stronger than most ordinary men, nonetheless remained a mortal man, who could be seriously wounded or killed. 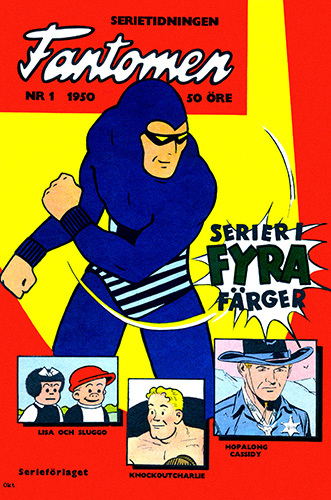 As far as superheroes go, the Phantom was just “super” enough to remain popular with Swedish readers. Another reason offered for The Phantom/Fantomen‘s popularity was that the series jungle setting in the Deep Woods resonated with many Swedes, who, according to one of my interviewees, retained close links with their families’ roots in the Swedish countryside, where many developed an abiding love for Sweden’s natural wilderness. Such comments highlight the intriguing ways in which different cultures can project aspects of their own national identity, or widely held national beliefs, onto the products of a foreign culture – in this case, an American-originated comic-strip hero, one whose very character and fictional world has been refashioned in ways that allow it to resonate with an international audience far-removed (historically, economically, demographically) from its country of origin. All of which got me wondering – is the Phantom not so much an American hero, but more of a ‘classical’ heroic archetype, one whose deeds and values can be found in the equivalent myths and legends of other cultures? Lee Falk always maintained that he was inspired by Arthurian and Nordic legend whilst creating The Phantom way back in 1935-36. This might go some way towards explaining why King Features Syndicate was so successful in selling the series throughout Europe in the mid-to-late 1930s, and why the character remained so popular in western Europe for many decades after World War II. My research findings are not sufficiently developed to make any definitive pronouncements about this aspect of The Phantom‘s international appeal, but it does chime in with my own long-held hunches (or “educated guesses”, if we’re feeling generous enough to call them that) – that the Phantom’s popularity is, in some part, due to the fact that he remains a decidely non-super superhero. Coupled with the series’ core concept of dynastic regeneration (wherein the eldest son assumes the mantle of the Phantom upon his father’s death), the Phantom achieves a degree of immortality that firmly places the character in the mythic realm. And, like the errant knights of old, the Phantom rides into battle astride a horse – his white stallion, “Hero”. While the idea of The Phantom comic-strip embodying competing notions of national identity across three different cultures examined in this project (i.e. Australia, India & Sweden) is a compelling one, it also leads to further, more complex questions. How does The Phantom remain relevant in societies where those long-held ideals of heroism and national identity are called into question, as those societies undergo cultural change? Is the Phantom a sufficiently robust heroic archetype, capable of absorbing and reflecting these changing definitions of national or cultural identity? Or does he represent an increasingly outmoded form of heroism, one that no longer “speaks” to the mainstream culture(s) of Australia, India and Sweden? I cannot be entirely sure if, at the end of this research project, I will be able to answer any of these questions definitively, but I think these are vital questions nonetheless, ones that merit further study and discussion. So, what do you think? Is the Phantom a universal hero, one whose appeal is capable of transcending different cultures? Feel free to post your comments here on this blog, or – better yet – share your thoughts in my online readers’ survey.